It was such a warmth time. In 21 February 2016 afternoon the alumni of CUMT in Toronto area gathered at the meeting room of the Trinity Financial Services Inc. Talking, laughing and food sharing that was the CUMT Alumni Association 2016 Spring Gathering. We exchanged information and share our life experiences. Unsurprisingly although we are all from a mining university, the alumni are working in all kinds of trading fields in Canada, which made our topic even richer. Good news are from our alumni, such as many job openings from the company AECL which Guo, Ruiping works for, if you have an engineer background and seeking for new opportunity you can contact with him. If you are planning a family vacation and don’t know where to start, and how much will be cost to you, give Zhang Shifu & Jiang Han a call, who both work for Sunwing. They can give you professional advice, tips, tricks and the most important – a good deal. Need legal advice, we have lawyer, Huang Weimin who met his wife at one of CUMT alumni gathering is running law firm in China and Canada. If you are in engineering trade and planning your career in Canada, the retired senior engineer Wang, Yan (Bob) is more gladly to give you guidance with his years industry experience in Canada. Also Wang, Ru(Rose) Bob’s wife runs health and well-being consulting business, she can give you some good suggestion of you life style. House Renovation, talk to Gao Zhifeng, who runs Aurora Marble and Granite Inc. We had alumni gathering once at his company. We do have many alumni in financial sector, like Liang Bin, Chen Xiaodong, Li Yueqin, Gu Lei, Jiang Han, Gao Hejun, etc. New alumni could talk to them for career planning and job opportunities. 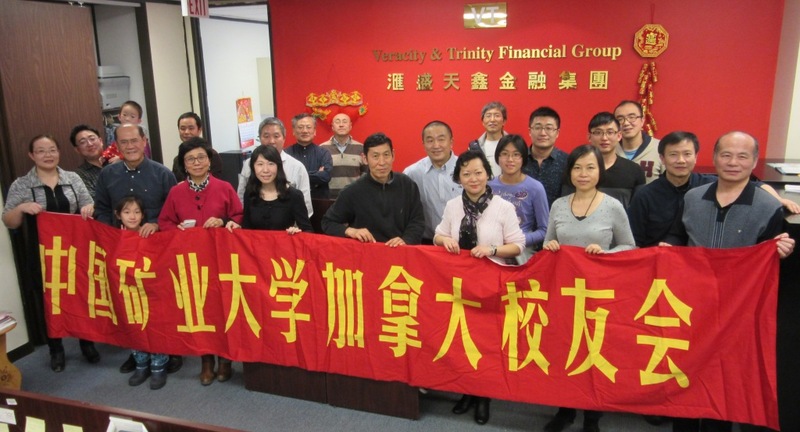 Taxation, insurance and financial services are provided by Gao Hejun’s company – Trinity Financial Services Inc. , which sponsored this gathering. We give thanks to him here. I wish nobody will need Zhu Qinjiu’s help, but if misfortune happened to you, who can give you physiotherapy treatment and help you claim your insurance. With his experience in car incident who can help you get out of misery day, and back into normal life. If you have children between 12 to18, I suggest you send your kids to Royal Canadian Air Cadet. It’s a place to learn the military knowledge, self discipline and leadership skill. Also I encourage our alumni and our next generation join in the Canadian Forces. Here I invite our alumni, your family and friends, come to visit CFB Trenton and National Air Force Museum. On June 25 and 26 this year, the Quinte International Air Show, hosted by 8 Wing/CFB Trenton, which takes flight, will commemorate the British Commonwealth Air Training Plan (BCATP) and the 75th anniversary of the 400 series of squadrons, designations still in use by the Royal Canadian Air Force (RCAF). Mark your calendar and come to have a visit. It has been for 12 years, the alumni of CUMT in Toronto area gathered once or twice per year. We are planning the next gathering now and give your suggestions any time to our organizers. See you all next gathering in summer time this year.